Hello everyone and thank you for joining us for the Surprise Blog Hop to celebrate Purple Onion Designs!! I really love playing with Purple Onion Designs stamps and joining this Hop is a great chance to celebrate this fabulous company and their awesome collections! If you love POD stamps as much as I do, you should definitely pop in their store and have a look around. And you’ll be happy to know that Purple Onion Designs Holiday Sale starts today, Friday, November 24 and runs through Friday, December 8. All stamps will be 25% off!! The sale includes all stamps in the sale category as well! 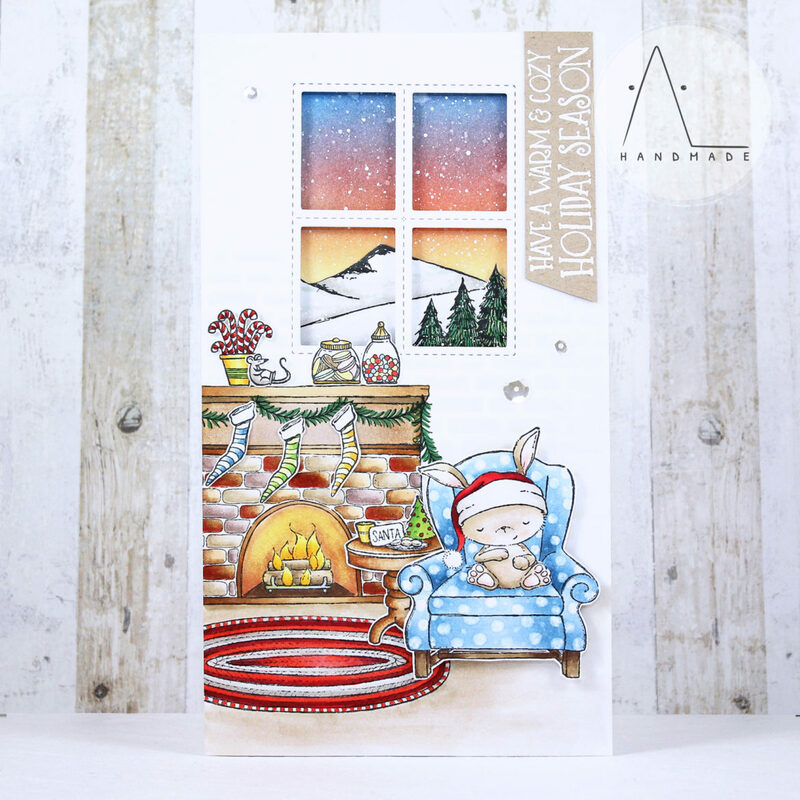 To create the card I’m sharing today I used some of the most adorable stamps from Twas The Night Before Christmas collection – the new stunning winter / holiday release from Purple Onion Designs – and I mixed them with some older stamps from the prior collections. I wanted to create a warm living room where to place Sugar Plum sleeping in a chair near the Fireplace & Rug, decorated with Fireplace Decor and with some candy jars on it (from Sweet Shop Set). So, I stamped the images with Memento Tuxedo Black ink and colored them with Copics. Then, I added a bit of texture to the armchair with my Colorless Blender and carefully fuzzy cut all the elements and created a cozy winter composition. For the landscape framed by the window, I ink blended Blueprint Sketch, Abandoned Coral and Wild Honey Distress Ink on white cardstock, creating a smooth sky gradient. Then, I added some white splatters on it to create a snowy effect, using a white calligraphy ink (diluted with water) for a crisp look. I stamped the Mountains background and colored it with Copics, before mounting it on my ink blended panel. Finally, I die cut a window at the top of my front panel using Framed Tags – Chelsea – Creative Cuts by Mama Elephant and placed my landscape behind it. To finish, I heat embossed the sentiment in white on kraft cardstock and added some sequins as embellishment. In celebration of this Surprise Blog Hop, the awesome Sandy Allnock is giving away 3 spots in a class of their choice to 3 lucky commenters along the blog hop. Be sure to check all the blogs for more inspirations and comment everywhere for a chance to win! If the winner has already purchased a class during the current sale, that class fee can be refunded. Winners will be posted on Sandy’s blog on December 1, 2017. Your next stop on the hop is the lovely Sally On. Happy crafting and Good luck! This is a fantastic card. Your ideas are great. I love the little purple onion characters. I wait for my order – the sweeties are one their way to me. Yeah!!! Happy weekend! LOVE this sweet scene and that CHAIR!!! Absolutely gorgeous, oh my!!! That window makes me wanna take a walk…then nap in that sweet polkadotted chair!!! What a sweet cozy scene! How cute is that! I love it and Purple Onion stamps. What a fantastic scene, it is amazing! This is a great little scene. This is a super sweet scene!! I think I need all these stamps…Love your polka dot chair and the way you colored the fireplace surround!! So cute. This card tells a wonderful story and makes me think about what it would be like to be sitting in a comfy chair next to a fire and taking a nap. Thanks for sharing your talent. Happy Holidays! Thank you for additional inspiration. I love how you took that scene stamp and used it in the window, brilliant. The window scene alone would have made a nice card, so much detail, beautiful! Such a cute little Christmas scene. So much detail. Love it! Goodness! How long did it take you to make this fabulous card? I love the details! What a great scene — I love the outdoors scene outside the window! Such details! And what a sleepy little bunny — I know how she feels! Such a cute card! Love how it tells a story! Thanks for sharing. Thank you for participating in this hop… really like your window scene you have created Anna! This card is amazing! All the detail is incredible! So pretty! Very detailed card. I love the bunny in the wing back chair. Thanks for the inspiration. Love all the details, super cute card! Love the card. Absolutely love Purple Onion Designs stamps! Fabulous card, love all the details!! Love the adorable scene you created! Awesome fireplace and stuffed chair with the bunny! Love the polka dots! So many fabulous details! There is so much to love about this card, from the cute scene to the absolutely gorgeous sky. Wow !! I’m speechless in front of such a delightful scene !! I can not believe how you were able to tie all of those cute little critters and extra stuff into such a beautiful and cohesive card. Bravo to you. Lovely scene – and a great view out the window! So cute! What an amazing scene! The detail and your coloring is just perfect! What a perfect little scene for Christmas. love how many stamps you used! What an amazing and super cute little scene you have created! Gorgeous card, loving that scene! Oh wow. Your scene looks so inviting. Everything is organised so well on your card as always. I think this bunny is my fav of all. Oh my goodness, what an ADORABLE little scene! So much attention to detail! This hop is really helping me get into the spirit of the holidays! It’s been in the 90s in California, and these cards bring back what the season is supposed to feel like. Thanks for sharing your talents with us. Love the clever and creative ways you make this card! If you sent that card to me, I would never be able to put it away with the rest of the Christmas decorations!! I LOVE all the parts of it–so nice! Your card is stunning ! I love little Sugar Plum, he’s so cute. And you did a fabulous creation with all the fantastic stamps from Purple Onion Designs. Cute fireplace and window scene. I absolutely love your scene! You put so much work and detail into this card. Thank you for the inspiration. Sweet scene! Cute bunny. Make me think of Good Night Moon for some reason. I follow you on Instagram, always love your Purple Onion cards! Beautiful card with a warm cosy feel, wonderful scene.. Love it! Most amazing scene, love all the details!! And your blog looks great, Anna!! 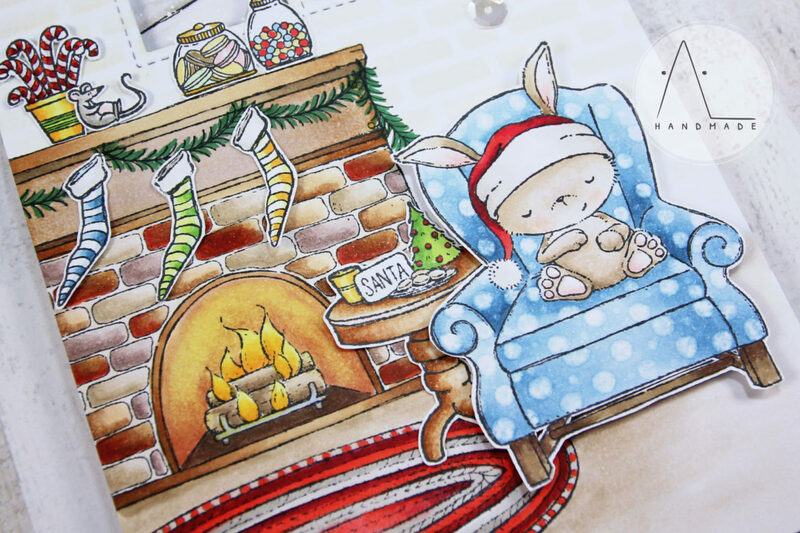 Omgoodness,your fireplace is super decorated.I love it.Im in love with this whimsical card. Such a sweet, peaceful scene you created for your card! Lovely! Awesome card! Not only cute but the window background is awesome–I want to be there! Very creative with the window frame. Love the card!!!!! What a great scene! Love all these elements you’ve pulled together! This is so adorable, I just love the wee little mouse. Your coloring and colors are beautiful. Great, great card! I so love this card. Where did you get the stitched window die? So cute! Hi Delia, thanks for your comment :) The stitched window die is from Framed Tags – Chelsea – Creative Cuts by Mama Elephant. Oh Anna, you ladies are killing me here with these amazing scenes. I totally NEED a class as I am beginning to think I should get rid of my supplies rather than buying more! Oh dear. This is such an amazing card! Well done. This is such a perfect card! I recently purchased a lot (my first lot :o) of Purple Onion Designs stamps and since I love creating scene type cards I really appreciate inspiration like yours. Thank you very much!